OTTAWA, September 11, 2018 — The Royal Architectural Institute of Canada (RAIC) will unveil a beautiful new design for the Governor General’s Medals in Architecture during the 2018 awards ceremony on Thursday in Winnipeg. Parallelogram House, designed by the high-profile Winnipeg firm 5468796 architecture, is among the 12 Governor General’s Medals in Architecture recipients. Johanna Hurme, chair of the Winnipeg Chamber of Commerce, is one of the firm’s co-founders. The Forks, Winnipeg’s much-loved gathering and recreational space, will receive the Legacy Project Award, given by the Canadian Society of Landscape Architects, at the public lecture. 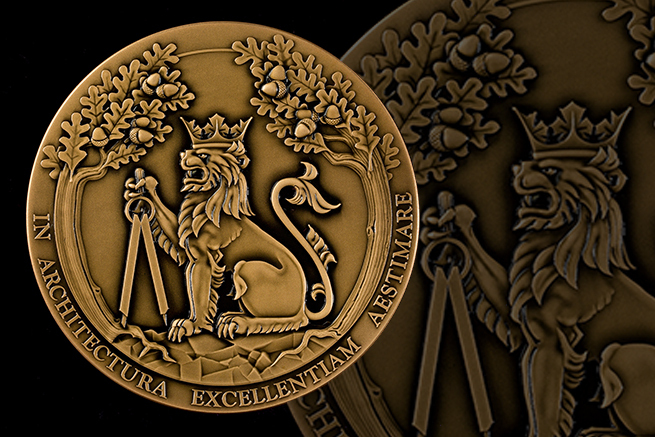 The image is encircled by a motto in Latin "Recognizing excellence in architecture” which is the purpose of the medals. The name of the winning project and firm is engraved on the reverse side. The medals were designed under the auspices of the Canadian Heraldic Authority with direction from the RAIC Board of Directors. The medals were produced by the Royal Canadian Mint. The previous medal was designed in 1982 and depicted a lion with a crown holding a maple leaf.